Storm Sports Store have an end of season sale on at the shop Sunday 7th April – 10-4PM. Pop in and have a nosy if you want some hockey memorabilia at good prices. This is also a great opportunity for rec hockey players to pick up some hockey kit at a bargain. 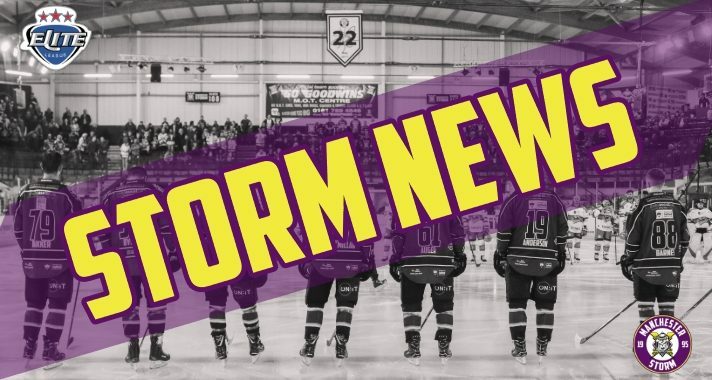 Your Go Goodwins sponsored Manchester Storm are delighted to announce that due to high demand, the extension of the season ticket renewal date until Friday 19th April! This means anyone who was a Season Ticket holder for the 2018/19 season, have an extra two weeks to secure their seats again for the upcoming 2019/20 season. Due to plenty of last minute applications, we wanted to give our 2018/19 season ticket holders the best opportunity to secure their current seats. The new deadline for this is Friday 19th April. From the 19th, the remainder of seats will be up for grabs and will be open to the general public. So, season ticket holders, make sure you reserve your seats for next season to avoid disappointment. There are also payment plans available for you to check out. For those concerned about having to pay upfront, don’t be. The payment plan means you won’t pay a thing until May! If you apply for your season tickets in the next few weeks, you can take advantage of the Early Bird offer, totalling £415. Following the Early Bird offer, the season ticket price will be £460. Why not save £45 and take advantage of this offer? You can view the seating plan & seats available by visiting the official Planet Ice website HERE. To apply for 2019/20 season tickets, just download the Application Form here and fill it in. There are a few options on how to give us your forms. You can send them back via email to [email protected] Storm Sports Store will also have a post box set up for you to post it if you’re at the rink.